This is a sponsored conversation written by me on behalf of McCain Foods, Inc. The opinions are entirely my own. Comments submitted may be displayed on other websites owned by the sponsoring brand. 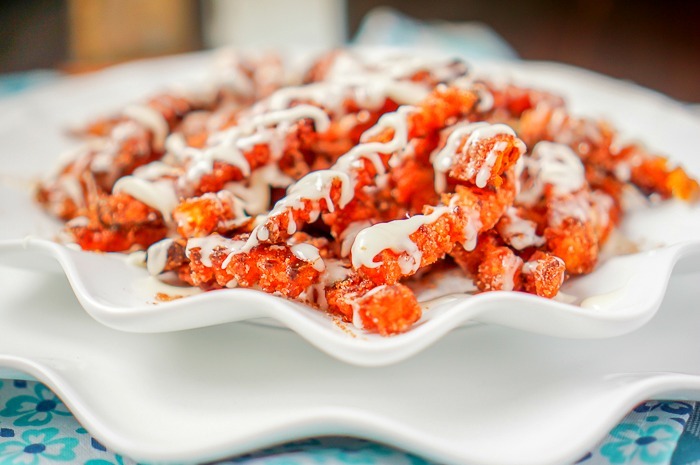 Unbelievably Good Dessert Sweet Potato Fries – Bake up a batch of Cinnamon Sugar Sweet Potato Fries for a sweet treat at your next gathering! Yes, you read correctly. 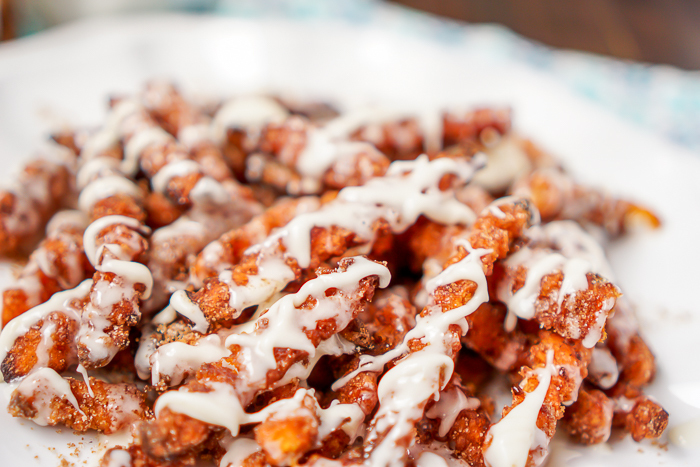 This recipe is for Dessert Sweet Potato Fries – Cinnamon Sugar Sweet Potato Dessert Fries to be exact – and they are delicious! 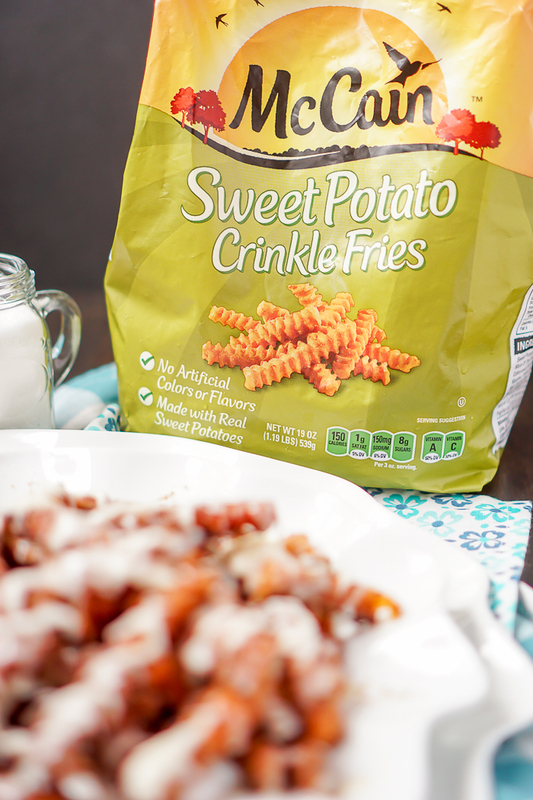 I know it might sound weird to you that vegetables can be a sweet treat, but these dessert fries are addicting. You should definitely give them a try with the family on a cool fall night or better yet whip up a batch for game day with friends and family over! I first got the idea when Bryan commented years ago on how he thought it was strange that I put brown sugar and cinnamon in my sweet mashed potatoes. Now, seeing as I grew up watching people do this to a whole sweet potato, I never thought it strange. Bryan now loves sweet potatoes, and I’ve come to realize a lot of people have never tried the combo before and are simply missing out. The cinnamon and brown sugar add the perfect touch of spice and sweetness to the earthy sweet potato, so why not try it with fries for a super simple dessert recipe. Preheat oven to 425 F, and line a large baking sheet with parchment paper. Place fries in a large bowl or ziplock bag and toss with cornstarch. It should be a thin coating. I find that the cornstarch helps with the extra moisture in the fries and in the sugars and helps make the fries crispier. Get rid of any extra cornstarch. Add sugar, brown sugar, and cinnamon into a bowl or another ziplock bag. Toss fries to coat. Add fries in a single layer on the baking sheet with space between the fries. If they are close together, they will steam and not get crispy. Bake for 15 minutes. Remove from the oven and flip. Then, return to the oven for 10-15 more minutes. The edges of the fries might get a little dark, but they will be more caramelized brown sugar than burnt. It's also not uncommon for the cinnamon/sugar mix on the pan to caramelize as well. Add the fries to a bowl and toss with remaining cinnamon/sugar mix. Combine powdered sugar, cream/milk and vanilla to make a vanilla glaze. Add more cream/milk 1/2 tbsp at a time after the first 3 tbsp until you get the desired thickness. Drizzle on top and reserve the remaining glaze for dipping. 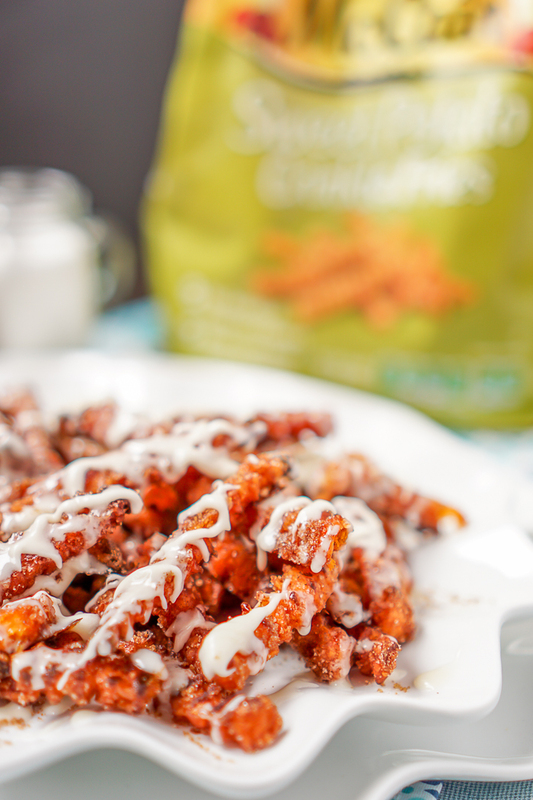 Because I love easy and fast recipes without sacrificing on flavor, I start with a bag of McCain’s Sweet Potato Fries which can be found in the freezer section of Mariano’s. Whether you are picking up their Sweet Potato Fries, their Smiles (so fun for kids!) or their 5 Minute Fries, you are picking up a bag of fries made from real potatoes which is important to me. Sweet Potato Fries are definitely my favorite though! 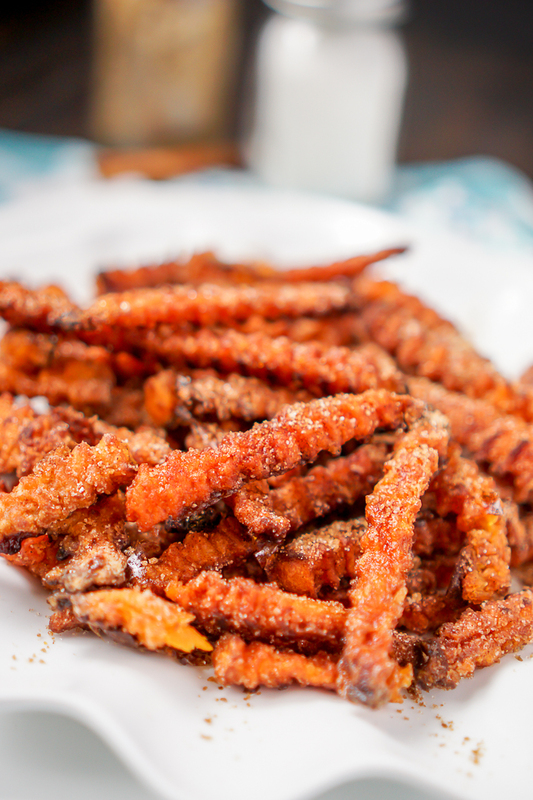 Toss McCain’s Sweet Potato Fries in cornstarch, followed by a mix of sugar, brown sugar and cinnamon. Then place in a single layer on a baking sheet and you are good to go. It’s really that simple and your kids, family, and friends will love them. They really are a sweet and tasty vegetable dessert! Good enough to eat on their own but why not add a little extra sweetness with a simple vanilla glaze? Finger licking good, y’all! Dessert Sweet Potato Fries are a fun way to celebrate the flavors of fall. What are some of your favorite fall recipes? !